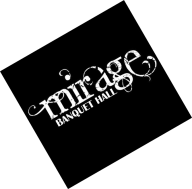 •	Room setup and clean up is provided by Mirage LLC. •	Standard rental length for a banquet is 5 hours. For each additional hour, a fee of $135.00 will be charged for room rental, security, and service personnel. This requires a 24 hour advanced notice. Price is subject to a 17% service fee and applicable sales tax. •	Black Linen skirting and tablecloths for: Cake Table, Head Table, Gift Table, Guest Tables, and Food Tables are provided by Mirage LLC. •	Mirage LLC, upon request, will provide cake cutting service at no additional charge. Set-up time of cake must be coordinated with hall coordinator. •	Entertainment (IE Bands, DJs) is the responsibility of the customer. Set-up and Tear-Down Time(s) of entertainment vendors must be coordinated with hall coordinator. •	Decorations may be rented through Mirage LLC or you may provide your own. Decoration plans for all events are to be approved in advance by hall coordinator. •	Confetti, sand, rice, birdseed, and bubbles are prohibited. Attachment of materials to ANY SURFACE is prohibited (i.e. tape, tacks, string, and nails). 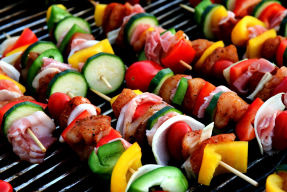 •	All food and beverage must be purchased through Mirage LLC. •	Indiana State Law prohibits outside alcoholic beverages to be brought onto premises. This includes the parking lot. Any guest found with alcohol will be asked to remove it from premises before contacting authorities. •	Bar Setup and security waiver is at a rate of $50.00 per evening event that bar is open. •	All of our clients have the choice of hours they would like to host their event. However, as a courtesy to our neighbors, all events will end Friday and Saturday by 11:00 PM and Sunday- Thursday by 10:30 PM. A payment equal to 1/2 the Room Rental Contract amount is required for guarantee of room rental reservation. Room rental is subject to a 17% service fee and applicable taxes. All deposits and payments are non-refundable. Prices are subject to change unless guaranteed by a signed food agreement and paid in full. All food, beverage, labor, and rental items are subject to a 17% service fee and applicable sales tax. If your group is tax exempt, please forward your tax certificate prior to the event.